Whilst away with my undeniably beautiful wife I suddenly had one of those ‘lady in red’ moments. Seeing her how everyone else must see her radiating her natural effervescent charm and alluring care-free personality. It was a delight, but also brought a little sadness that I clearly take it all for granted most of the time. I think we can all be like that about life sometimes. I once read a statistic that it’s only as tourists that we tend to look up. 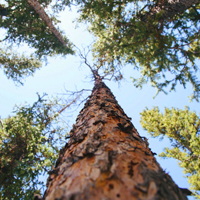 In our day-to-day life we miss most things above our line of sight. Every time I recall that fact, I make a determined effort to look up and I’m always surprised at what I see that I take for granted or completely miss out on most of the time. We all know those moments when a sight suddenly overwhelms us in a positive way; a stunning sunset, a clear blue or starry sky, a sunrise through some mist-filled mountains. But how often do we stop and take a moment to realise how incredibly lucky we are to even live where and how we do? I suggest 90% of people in the world would want what we have and yet we’re too engrossed in our every day lives and pursuits that we can easily overlook it ourselves. I’m not suggesting we walk around in a constant state of awareness and thankfulness (although to do so would be magnificent, eh?). But I feel we could all do with being thankful more. I know I’ll let things slip again and again, but I’m going to pledge to make more time for life and appreciation; be thankful more; enjoy more sunsets, sunrises and starry skies. But, most of all, look up more. And whilst I’m at it, pledge to have a lot more ‘lady in red’ moments. She deserves that… and sooo much more! OK, whilst on the subject of Susanne, I am still on holiday so am going to bang through this month’s delights, if I may, so I can get back to her! Kicking off, on December 28th we have our now iconic winter exhibition. This street-party exhibition with snacks from the Hidden Hut team has become an ever growing favourite, so if you can make it, believe me, it’ll be a corker. It’s from 6pm on December 28th but all works (this year’s title is ‘My Secret Passion’ so some cracking work I suspect) will go live on the website the day before, so make a note in your diary if you want first dibs! 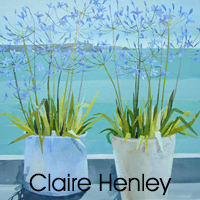 As for new work this month, we’ve had some magnificent newbies in from the ever popular Claire Henley. 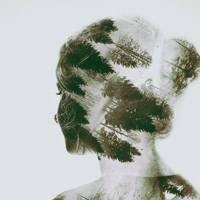 She’s been selling like hotcakes, so these newbies are just restocking us… and how! 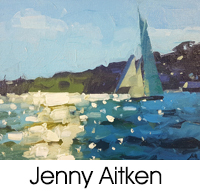 Jenny Aitken just sent in another cracker so to be first to see that, login to her page asap. 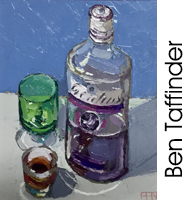 And our impasto king, Ben Taffinder posted two newbies to replace his sales this month. Better get in quick, tho! John Hopkins sent over a beautifully tranquil watercolour of Carne. Man that fella can paint! 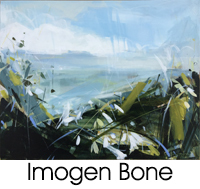 And I was about to include a brand newbie from Imogen Bone, but it sold within 5 hours of coming in, so more will be on the way from her… keep your eyes peeled on her page for those! 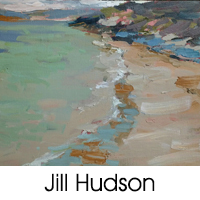 Lastly, Jill Hudson added three more this week and I believe more will be coming, soon, so check these out before they sell as fast as the last lot did! In closing, I want to let you know about a really exciting exclusive event happening from January 2nd. It will only be available for those on our newsletter list, so if you haven’t signed up, you have December to do so! Spread the word, too, folks… it’ll be worth it! Oh and if you want something for that special person for Christmas, we’ll do all we can to get it to you in time, but International works will have to be sent before Friday 15th to have a chance of getting there on time and I would suggest no later than Mon/Tues 17th/18th for inland artworks. We’ll of course do all we can to get them to you however it works out! Have a schamazeballs Crimbles, ya’ll and here’s to a fabulous run into 2019! Last week I was asked to help Falmouth College students with mock job interviews. Asked where he saw himself in five years, one of the students boldly stated he wanted to be a rich and powerful CEO… and was unapologetic in this aim.